The usual length of a domestic workshop is three or five days while a foreign one will be longer, depending on the destination. I encourage sketchbook journaling to create memories of an area and often use those sketches as preparation for larger efforts. I aim to teach in a sequential manner, building on what has already been presented. Although drawing ability comes first, the focus is on the art of picture making, composition and design, applicable in any medium. Demonstrations are in watercolor but students using acrylics are welcome. Studio painters might consider my workshop as an introduction to working on location, since finishing touches can be added in the comfort of our studio or meeting room. 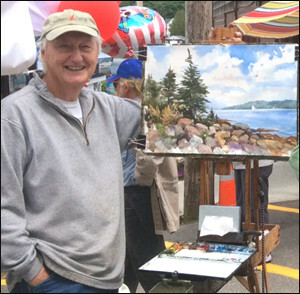 Weather permitting, the daily schedule starts with a plein air lecture-demonstration. After exposure to some basic on location advice, students are free to select a subject and paint on their own, while I circulate and assist on an individual basis. I consider myself more a coach rather than an instructor. After all, there are many ways to approach a subject and the enjoyment is in exploring your own style and direction. In the late afternoon, a “sharing session” is held back in the studio, usually under a large overhead mirror so all can see. This session is a very important part of the learning process because it enables one to benefit from suggested improvements and see how those might affect the work of other participants. Since artists are visually oriented, I not only discuss suggested changes, but often paint them directly onto a clear acetate overlay so everyone can see how these changes may improve the day’s effort. Your own work is never touched and you are encouraged to photograph results.